Ewasted definitely gets 5 stars out of 5. Shipping was fast and easy. From shipment day to check was only 7 days. A big pat on the back to them for the fast processing and fast payment. Thanks. Hello all just an update - My package was just received by ewasted and I'm super excited to see the results!! I had an excellent experience with Ewasted yesterday as well. I would trust this gentleman in the future if shipping escrap(took mine in person). Informative, friendly and knows his scrap.. Quite the business man!! Here is my review for my experience in dealing with Ewasted for the Sierra Storm Synchronized Ice Skating Team Fundraiser. Through my endless remedial questions Ewasted's company has made my 1st selling experience simple and painless. The difference in the amount that was earned by selling to Cash For Computer Scrap instead of the original company that we started working with is insane. We would have had to collect around 3,268lbs of material in order to get the $163.39 that we got from the approximately 55lbs that was sent to Ewasted and that isn't even taking the shipping costs into consideration. Official rating - A++ and 12 out of 10! The team and I thank you so very much for helping us maximize the money gained from the end of season fundraiser. 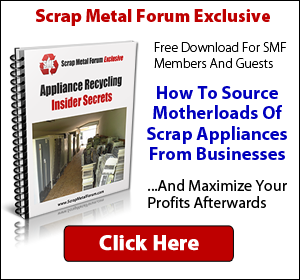 If I get the opportunity, I will absolutely do more business with Cash For Computer Scrap! After reading alot of info on this website and studying buyers on here I sent my first shipment off to Ewasted. 27 lb box of an assortment of stuff. Sent it Thursday, they received it yesterday and cut me a check for $103.97 today. There weight matched mine almost exactly. Actually got $13 more than I had calculated. Felt well taken care of and dealt with honestly. I look forwared to doing more business with them as I learn how to get contacts and clients and get more boards. Thank you Mario and staff. Thanks for the kind words. I will pass the word on to the team, they are the ones responsible for the smooth service. I only field the majority of the questions since I know the material better than anyone else here. E-Wasted is most likely the most trusted Dude on here you never hear of him shutting down his Business for any reason. NONE Also you don't see his web site asking for you to call him because They may not be there when someone wants to deliver a Load like some others do. Agreed hes always accommodating my business any day of the week and even sat/sunday if we need to come out. The only time it's been a problem was when he switched banks and i know how crazy that can be so it was a non issue. We transitioned EVERYTHING from our old bank, a much needed move. This move was strategic and will offer more value to our customers. We will have an announcement to make here in the next few days alot of customers will be happy about. I appreciate his consistent, professional approach to the forum. Putting together my first ever, shipment this week. Guess I should've asked about that before I sent my load... lol I held on to the CPUs that I didn't have 1/4lb of yet. Oops! Working on the testimonial that you asked for too. Looking to sell you a gaylord (maybe a little more) of mixed circuit boards, a gaylord (maybe a little more) of power supplies, a few other items less than gaylord including scrap laptops, dual socket server boards and such. How much you pay for ic chips ,and mid grade boards. When you update prices can you make a spot below them of what your prices previously were? Would be nice to have a quick glance and see if your prices went up or down. Also for pentium pro's does that include the pentium chips that are not huge but still gold capped and not labled "pro"
I have tons like that but also some that are larger than that but not the full size of "pentium pro" ones. Last edited by drozenski; 04-17-2012 at 11:41 AM. Check arrived yesterday so first transaction with Ewasted complete. Very happy with the report of things sent in so I could compare it with my notes and satisfied with the final payout. 10 out of 10...pleasure doing business. Here's his basic shipping info.